Delicious & colorful salad. Grate a carrot or two – fine or coarse is up to you. Toss with a handful of blueberries, a teaspoon of olive oil, lemon juice and plenty of black pepper to taste. Top with toasted sunflower seeds. 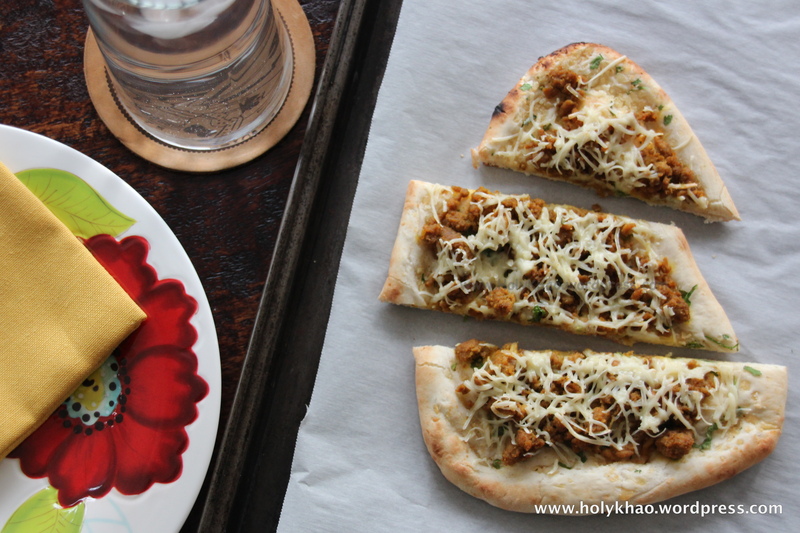 After a long break and a crazy-busy summer with family visiting from India, I’m back again with a quick and easy recipe that will wow your eyes & taste-buds. 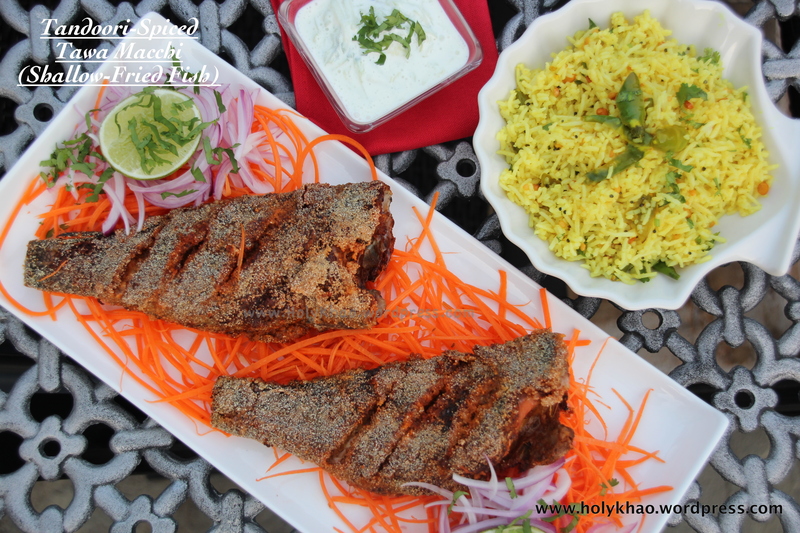 This shallow-fried whole fish fry cooks in minutes and can be customized to suit your tastes – the possibilities are endless. The recipe below is more of a guide – feel free to use masalas / seasoning of your choice, making it as spicy or as mild as you like. I used a homemade tandoori masala mix that I wrote down in my recipe book about two decades ago when Indian stores were not so common in America. The recipe is from Martha Stewart (can’t remember the actual source as it’s been so long). 1) Thoroughly wash the fish and drain completely. Pat dry with paper towels and set on a flat plate. 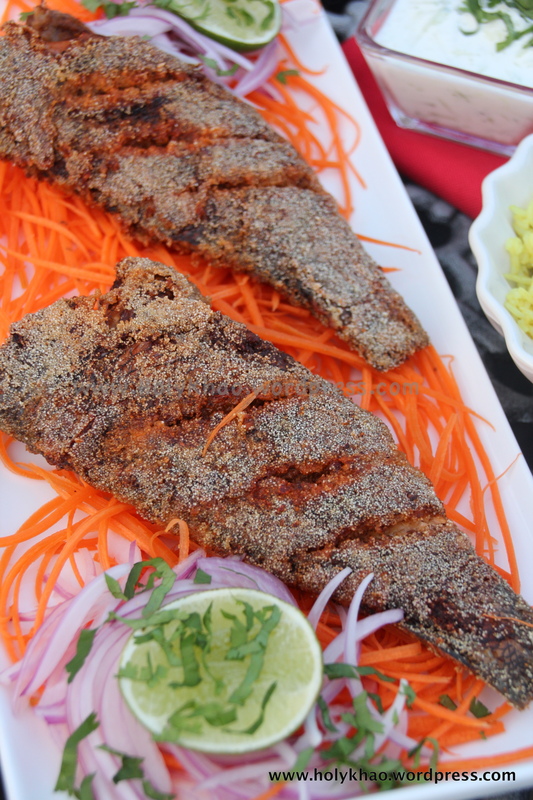 2) Generously apply the tandoori masala paste in the scores on the skin and on the insides. 3) Cover the fish and refrigerate for at least 2-3 hours . 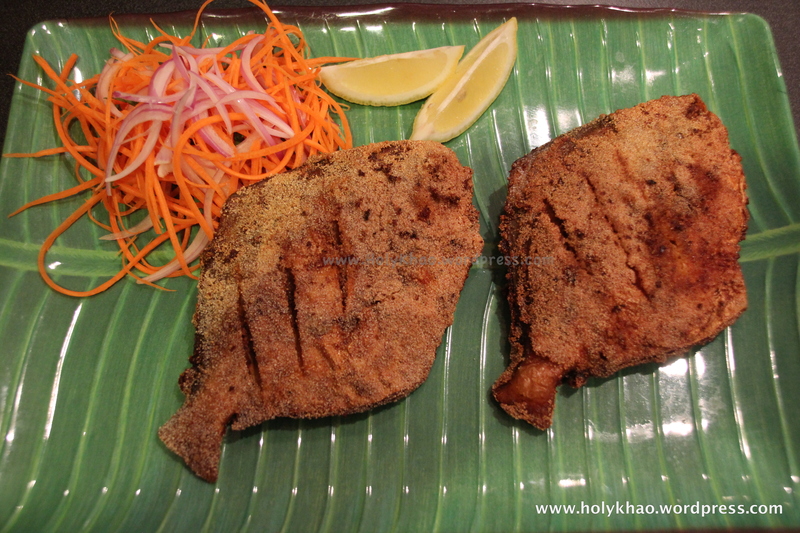 4) To fry, remove fish from refrigerator and allow to sit for 15-20 minutes at room temperature. 5) Pour about 1/4 cup oil into a flat, wide, heavy-bottomed pan and heat on medium. 6) Place semolina in a flat shallow plate/container and gently roll the fish to lightly coat. 7) Place the fish in the hot oil on its side and cook – carefully turning midway – about 4 to 5 minutes per side. 8) Drain and remove when the fish is golden and has a crispy coating. 9) Continue cooking the rest of the fish the same way, adding more oil as needed. 10) Sprinkle with chaat masala and a squeeze of lemon juice if desired. Serve with lemon / coconut rice and raita. This is a traditional South Indian rice dish (chitranna in Kannada) that is eaten at room temperature and is served with a side of vegetables. While not traditionally served with meat, I feel it lends itself well to easy, make-ahead summer meals. 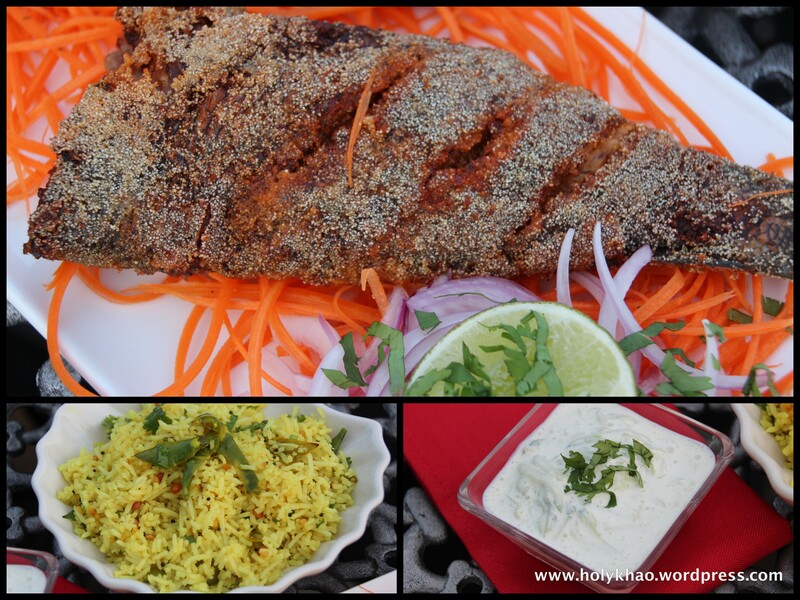 Plus the zesty lemon taste goes well with the spicy fish and the creamy raita. 1) In a small saucepan, heat the oil over medium flame. 2) Add mustard seeds and partially cover till they pop. 3) Add the chana dal, stir for a few seconds and then add udad dal. Stir till just starting to turn light brown. 4) Add the slit green chillies and cook about 30 seconds, partially covering lid so it doesn’t splatter oil onto your hands or face. 5) Turn off stove, add turmeric and stir. Allow to cool. 6) To serve, add the seasoning mixture, salt, lemon juice & cilantro to the rice and mix well. 1) Mix all ingredients and serve chilled. Warm weather meals and entertaining call for easy, make-ahead dishes that are light and tasty. I came across this recipe on the holidaykitchen.tv YouTube channel and made a few changes to suit our tastes. 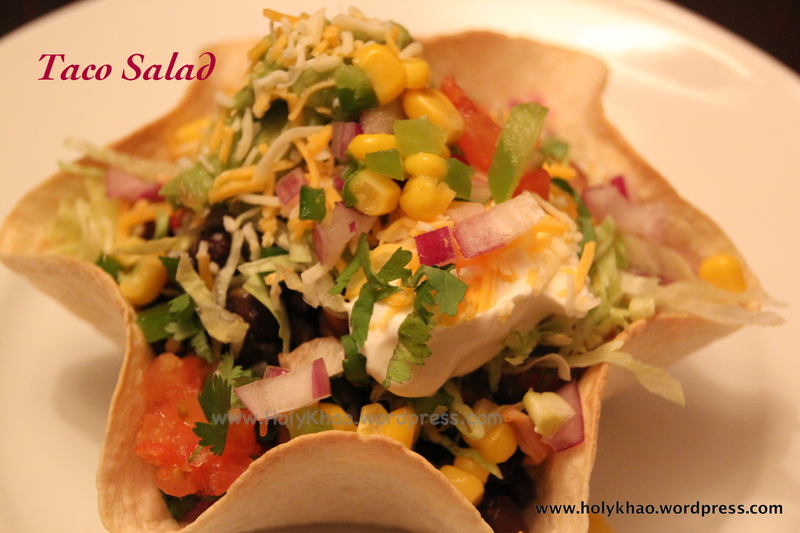 It is a good alternative to regular pasta salad as it doesn’t have any mayonnaise. 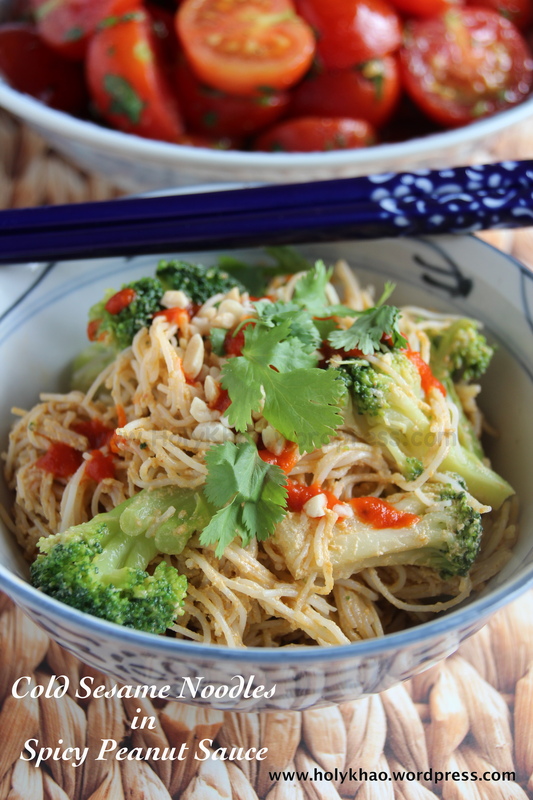 PS: Did you know that noodles are symbolic of longevity in China? It is considered inauspicious to cut a strand, and is traditionally served in as long a piece (strand?) as possible, especially on New Year’s Day. 1) Cook the noodles according to package directions. Rinse in cold water and drain completely. Allow to cool completely. 2) Add all ingredients to a small blender jar and process till smooth & creamy. 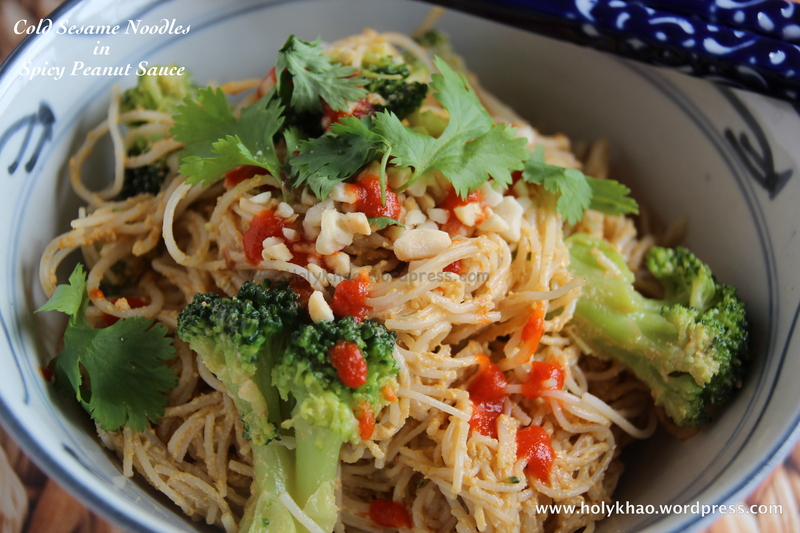 3) Toss with cold noodles, broccoli & carrots, and chicken/shrimp (if using) and set aside for an hour or two for all the flavors to meld. 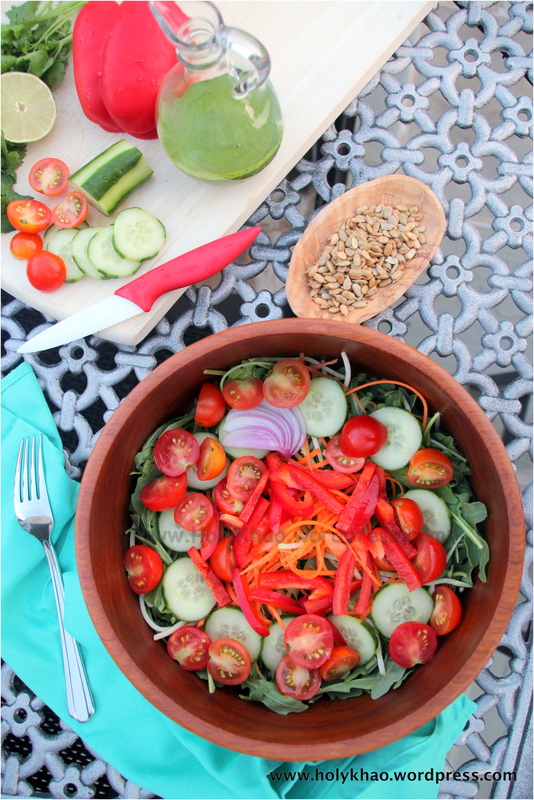 4) Divide into serving bowls and top with chopped cucumber, crushed peanuts, a sprinkle of toasted sesame seeds & cilantro. Signing up for a fitness challenge at Gold’s Gym and having a trainer has meant that I have started to watch what I eat – grudgingly, but I’m doing it. I don’t believe in starving or depriving myself, or in any of the no carb/ high protein/ gluten free/ paleo/ etc diets – I guess I just don’t have the discipline for them. I’ve realized that our (my family’s) food philosophy should be to eat like our parents & grandparents – seasonal, whole foods, variety, primarily plant based, occasional indulgences without guilt, and moderation. While I still sneak a bite of the PBJ sandwich, and enjoy an occasional cupcake, I have definitely incorporated a fruit and atleast one vegetable as the main source of each meal. 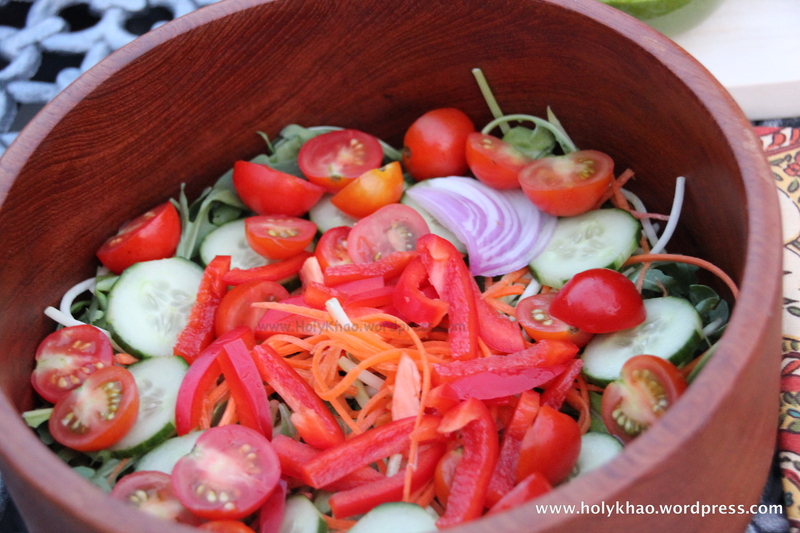 With conscious eating, I am more appreciative of colors, flavors and texture now than ever before. 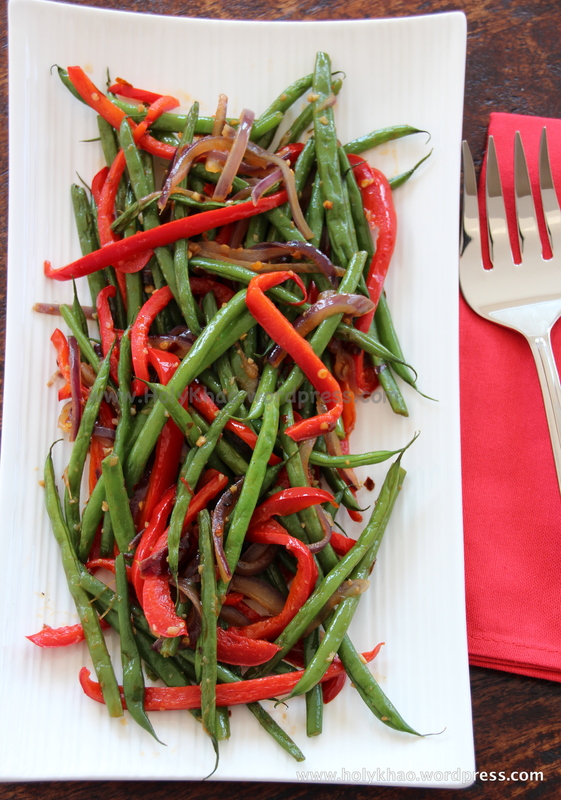 I made this Green Beans & Red Pepper Medley during one of the snow day holidays when I had to make do with what I had at home. With warm weather picnics & barbecues in the horizon, this is a make-ahead healthy side that is great on the taste buds as it is on the eyes. Pair with grilled meat, veggie burgers or even as an unusual but always much welcome option for an appetizer. My teenager had to be shooed away from eating these straight from the pan!! The recipe here, again, is just a guide – feel free to adjust the seasoning & quantity to suit your tastes. I use this simple seasoning for many of my vegetable sides – brussel sprouts, broccoli, asparagus, etc – and either pan roast or oven roast ( my preferred method). Just toss the raw cut veggies in olive oil, chilli flakes, minced garlic and salt. Transfer to a flat baking tray and bake at 425*F for 8-10 mins till they are cooked but still crunchy. My family never complains about eating their veggies this way. NOTE: The recipe shows a lot of steps because I have explained in detail how to blanch the vegetables. This dish is very easy to put together. 1) Bring about 8-10 cups of water to boil in a large pan. 2) Meanwhile, add ice to another large bowl with water and set close to the stove. 3) When the water boils in the first pan on the stovetop, add about 1-2 tablespoon of salt and the beans (salt generously – this will keep the color of the beans vibrant, yet will not be absorbed heavily by the vegetables). Continue cooking for another 3-4 minutes on high flame. 4) Taste test a bean to see if it is slightly tender and lightly salty. It should still be crunchy. At this point, quickly use a strainer or tongs to remove the beans and transfer immediately into the ice water. Depending on the size of your pots and the amount of beans being used, you may have to work in small batches. 5) Let the beans cool completely in the ice water – this will stop the cooking process and retain the color. Touch after a few minutes to make sure they are no longer warm. 6) Drain completely – do not allow the beans to sit in the cold water for a long time or they will become soggy – and spread on a clean kitchen towel or paper towels to remove as much moisture as possible. 7) Heat the same large pot on medium-high flame, and add 1/2 – 1 tablespoon oil to it. 8) Add the garlic and saute few seconds till lightly golden. Toss in the chilli flakes and stir. 9) Now add the sliced onions and saute on medium-high flame till translucent. 10) Add the sliced red pepper and saute for about 2-3 minutes till slightly tender. 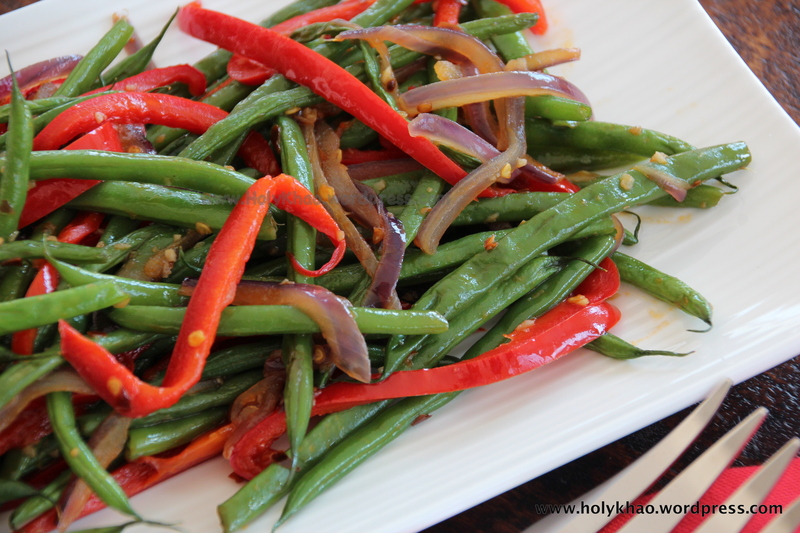 11) Add the drained green beans and salt to taste and saute on a high flame till all the vegetables are starting to slightly brown, but are still crisp and crunchy. 12) Remove to a platter and serve hot or at room temperature. Are you tired of eating the same (or variations of the same) food at almost all social gatherings you go to? For us, it’s usually South Indian food – delicious most of the time – but there are only so many variations I can enjoy before it starts to get monotonous. I wanted a change for when we entertained over the holidays, and decided to do away with Indian food altogether, but we had to have something with similar spices & heat to meet the needs of the Indian palate. Mexican to the rescue!! (Or, at-least, the Americanized version of it :)). 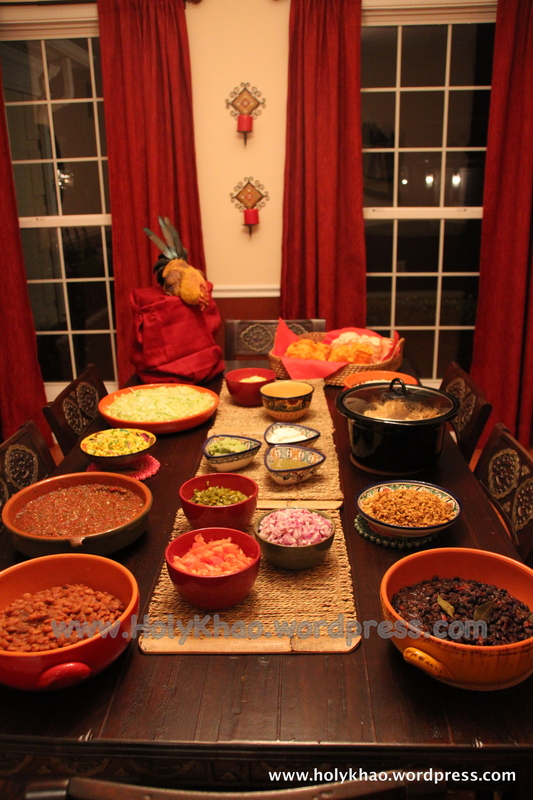 I wanted to keep the meal easy and informal, where guests could choose from a variety of items that did not require much attention once laid out. So, Chipotle-style it was. 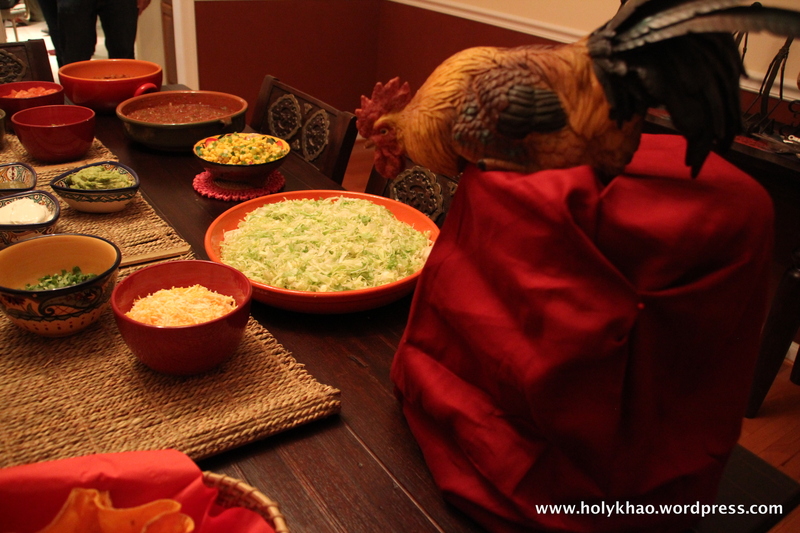 I apologize for the low quality photos – I forgot to take them before my family arrived, and didn’t realize till I was setting the table. 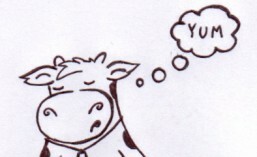 Plus, I had a very hungry mom-to-be hovering by the table, ready to eat and didn’t want to keep her waiting any longer. This will definitely feature again at my house, and I promise to take better photos and update here. In the meantime, you can see the almost-ready table pictures that were clicked by my then-9-year old. This meal served about 15-20 people. The quantities can be scaled up or down based on the number of people you want to serve. Leftovers freeze well, and can be reheated for a quick meal later. Dessert was Eggless Arroz Con Leche – Mexican Rice Pudding. Creamy, and fragrant with cinnamon, it was delicious. Unfortunately, I don’t have pictures, but will post them next time I make it. 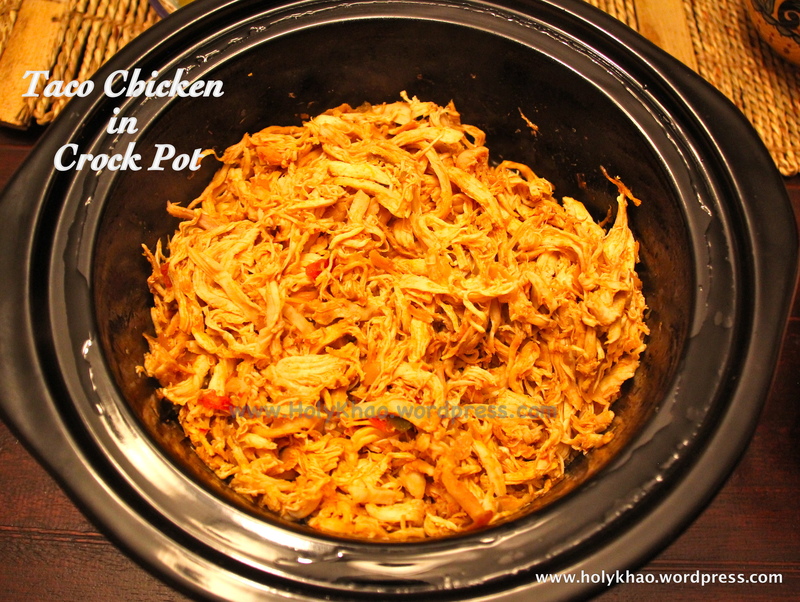 Posted in Crock Pot, Eggless, Rice, Salad, Sides, Vegetarian. Ok….I know I sound like a braggart using this title. But really!!! 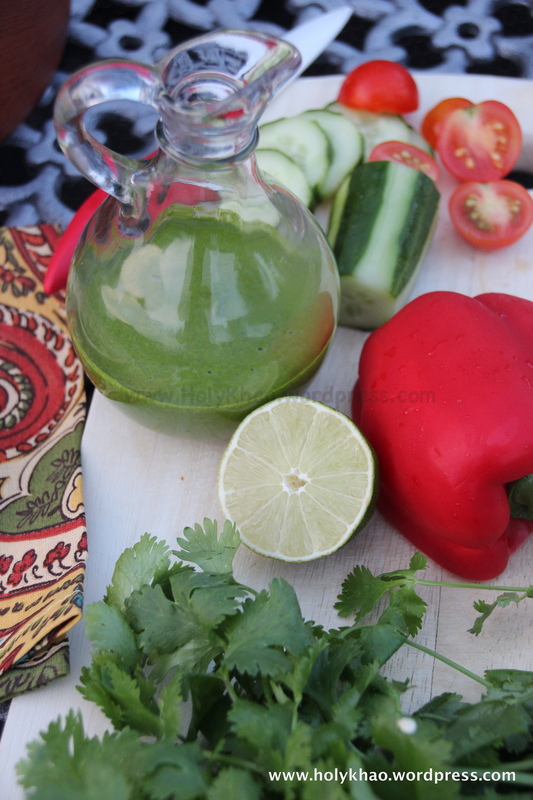 – this is truly the best salsa I have ever eaten!! (Notice all the exclamation marks.) 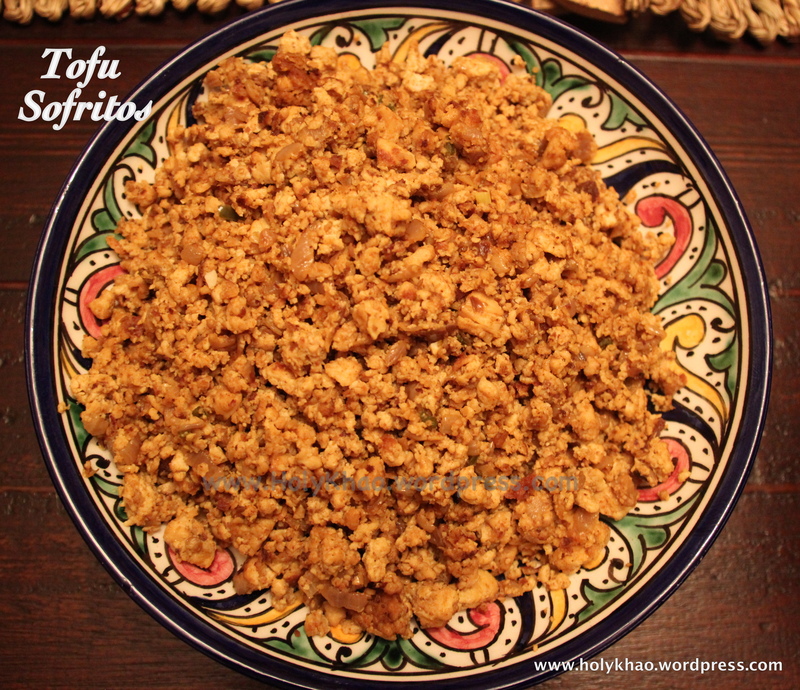 I got this recipe from my friend Soumya, and no store bought version even comes close. 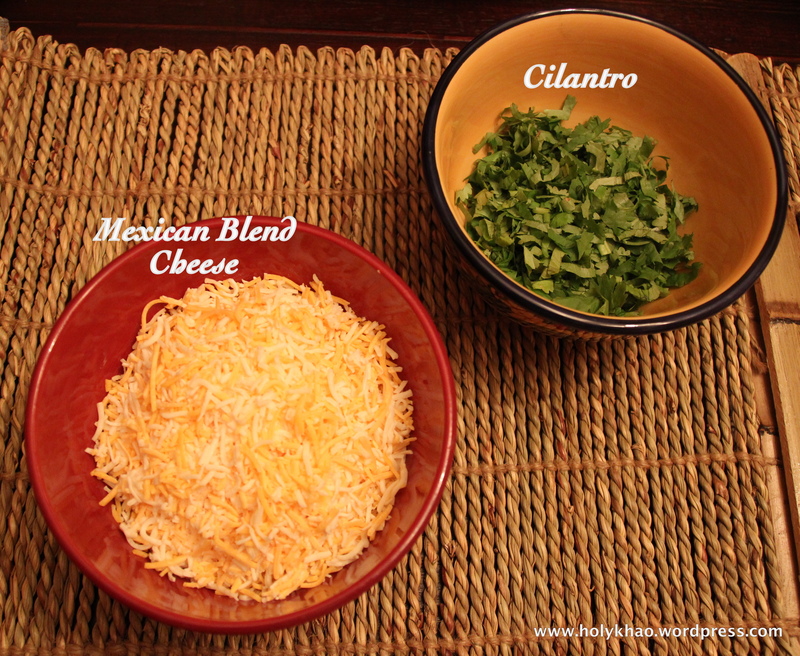 My family loves their chip and 7-layer dip, and they always ask me to make a BIG batch of this yummy and easy salsa. The icing on the cake is that it keeps well in the refrigerator for a few days AND it freezes well too. What’s not to love about that?!?! 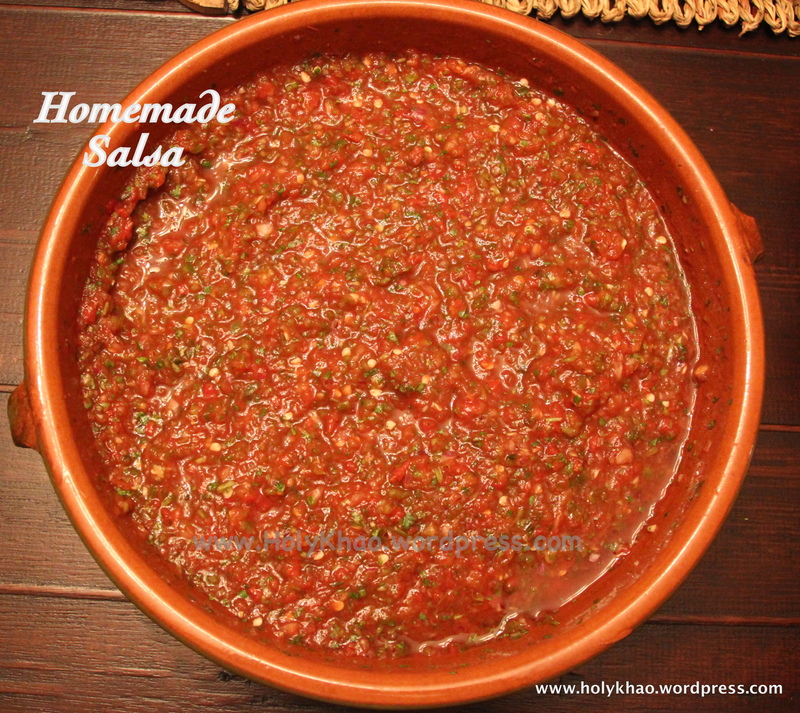 I have tried making this salsa with fresh or canned whole or canned crushed tomatoes. It just seems to taste better with canned diced tomatoes; stock up on a few cans from Costco and you whip up a batch in no time :). 1) Add all the ingredients in a big food processor jar and pulse till it reaches desired consistency. I like my finely minced. 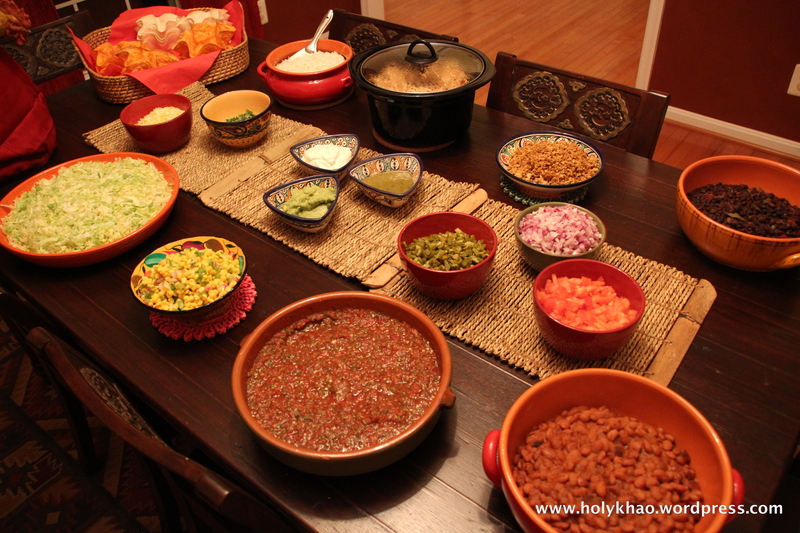 Served with our Homemade Chipotle-Style Buffet and Tortilla Salad (Lots of Vegetarian Options). This is super easy to put together, and is so colorful on the table. 1) Heat a wide, flat-bottom pan on medium high. Add oil. 2) Saute the onions till just turning soft, about 1 minute. 3) Add jalapenos & peppers and saute for another minute. 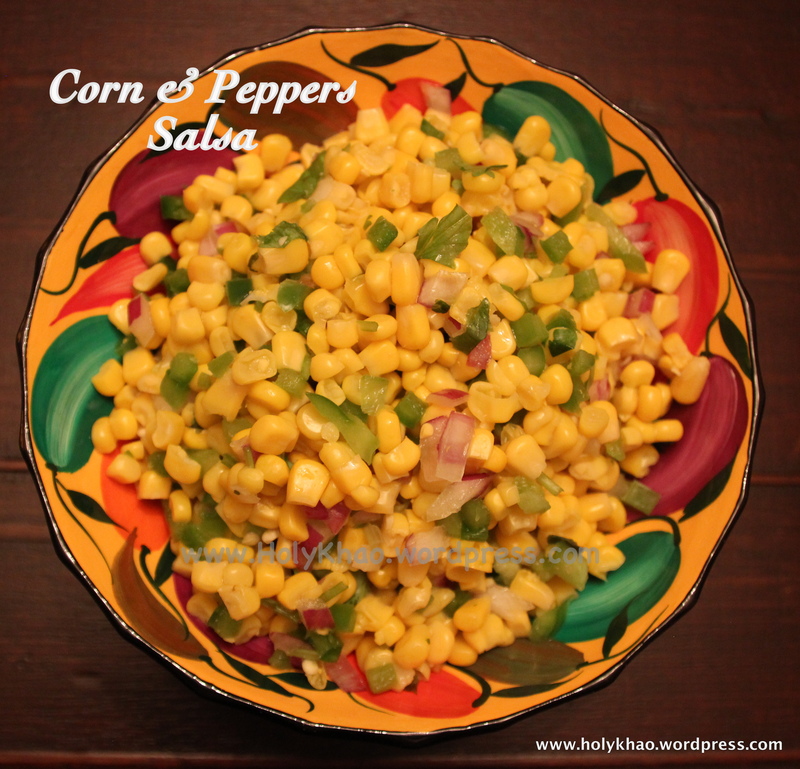 4) Add corn & salt and saute for 2-3 minutes. Remove from heat and cool. 5) Adjust lime juice and salt to taste and serve.